We as a family loves and everyone has their own salad favorites, and my daughter prefers only red bell pepper, carrot, apple, and berries in their salad. Son wants only fruits in his salad. I eat all except celery in my salad, hubby who eats everything without any complain. 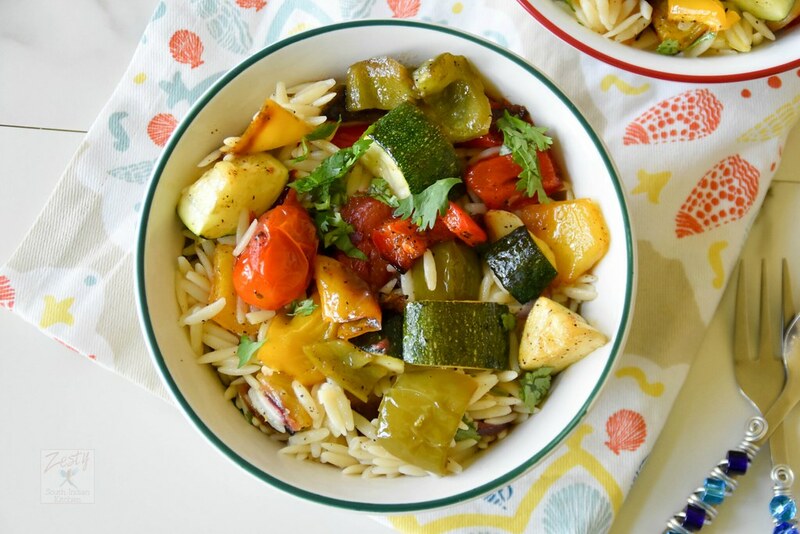 I have bought a packet of orzo for long time which needs to be used up and hence decided to try this roasted veggies and Orzo salad. I cook with veggies every day, but when it comes to roasting them, I only do it occasionally. I got this recipe from this book which I borrowed from the library. Weight Watchers Family Meals: 250 Recipes for Bringing Family, Friends, and Food Together (Weight Watchers Lifestyle). I liked the recipe even though it requires some preparation. Yes roasting the veggies, cooking orzo and making dressing. But it was worth the effort, and it turned out be a delicious and filling salad. I thought it as side but turned out be filling one. I changed the recipe little bit adding cherry tomatoes instead of olives and skipped oregano. My mother and grandmother have only roasted whole corn, eggplant, onion and red chilies. I never see them roasting any other veggies. But now I roast everything still occasionally. For this salad I roasted onion, red, green, yellow peppers, cherry tomatoes, zucchinis, garlic cloves. The dressing is so simple only olive oil, lemon juice, lemon zest and pepper. I think this recipe is really good you can make ahead. Great for lunch or dinner may be next time I will add little chipotle pepper to spice up you don’t need to do it. As I love spicy food, I think adding little bit of spice will enhance this salad even more. Give it a try, this will be great idea for busy nights as school are beginning to open soon. Let me how it turned out. 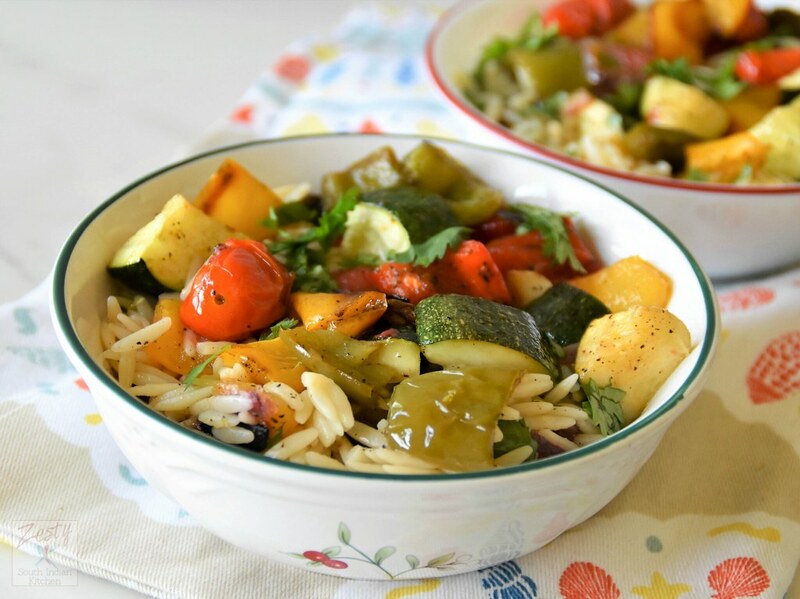 Delicious filling salad with roasted veggies and orzo easy and simple dressing. Pre-heat oven to 452F Line a baking sheet with foil and set aside. In a bowl add olive oil, ¼ teaspoon salt, ¼ teaspoon black peppers and then add colored peppers and onion and mix well and spread evenly in the prepared baking sheet. And roast for 15 minutes. After 15 minutes add zucchini and cheery tomatoes on top of roasted vegetables and roast for another 15 minutes. Meanwhile cook orzo according to package instructions, drain in colander and rinse briefly under water and set aside. 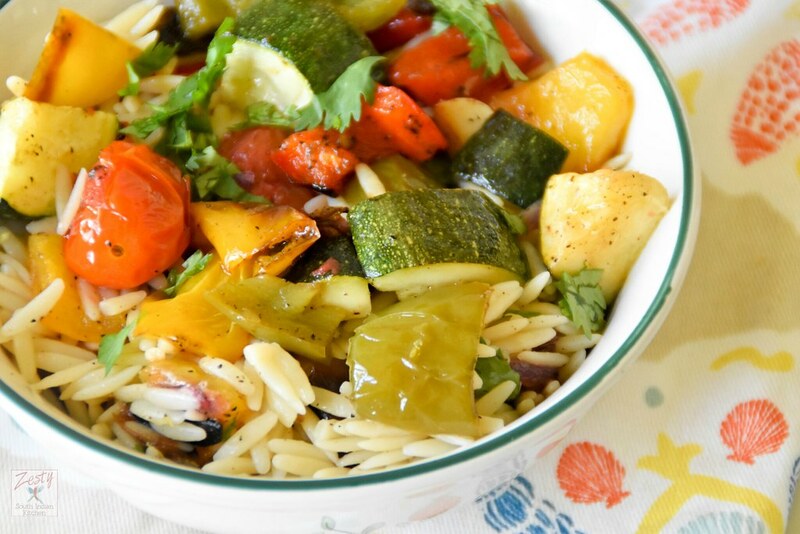 Orzo is one of my favorites. It’s so underused in the culinary world. Roasting veggies is my favorite ways to prepare vegetables because it’s so easy and it brings out the best flavors. I love orzo but don’t cook with it nearly enough. 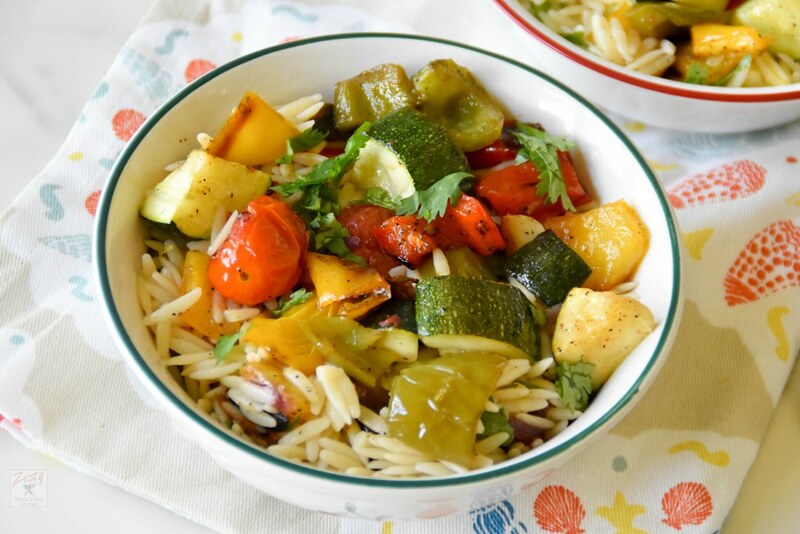 Love the combo of roasted veggies with orzo. This is a great dish to enjoy during the summer to fall transition as we enjoy more roasted veggies! I bet a chipoltle would be a great addition. I can also see a poblano as being really great in this. This salad sounds delicious. I ONLY roast or grill veggies….well except when I have to make mashed potatoes for the holiday meals. One thing about salad, it that everyone can tweak it to their liking. Leave out the stuff you don’t want, and pile on the stuff you do. I love roasted veggies especially in salad. Never added orzo in my salad before. Cant’ wait to try. Swathi, this recipe reminds me of one that my best friend shared with me – many – years ago. I’ve long since lost her recipe, sigh. I’ll be making your version soon. I love using vegetables as a large part of the meal. Yum! I’ve been trying to incorporate more veggies in my diet, so this sounds like a wonderful way!